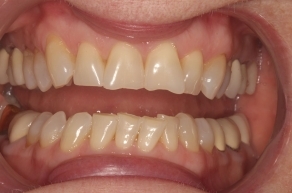 Our previous blog post shared how “Rachel C.” was tired of being self-conscious because of her damaged front teeth. 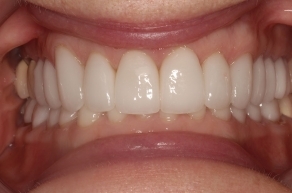 When she came into our Newport Beach cosmetic dentistry office, Dr. John Cross thought she would be the perfect candidate for a Smile Makeover. Rachel came to us as part of our participation in the American Academy of Cosmetic Dentistry Charitable Foundation’s Give Back a Smile program, and we are so happy that we could help her restore her smile. Rachel said she really appreciated how Dr. Cross clearly explained each detail of her treatment plan. 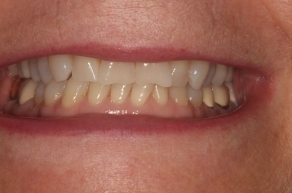 By the time Rachel finished her Smile Makeover treatment, her teeth were fully restored after she had a root canal, some fillings, and teeth extraction. 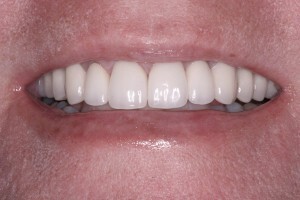 Dr. Cross also had dental implants along with porcelain crowns placed along the areas of missing teeth. These crowns were customized to Rachel’s unique needs in order to make them look and feel as natural as possible. Delighted with her new smile, Rachel was confident enough to get a new job offering twice her previous salary. When we followed up with her later, she was still ecstatic about the results of her smile makeover and thanked everyone for giving her a beautiful, bright smile. 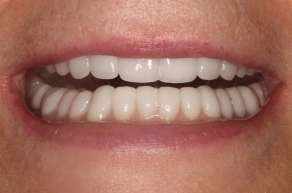 To learn more about Rachel’s amazing transformation, or if you would like to talk to Dr. Cross about getting a smile makeover, please contact OC Lifesmiles today.